Hi, I am interested in your 1976 Triumph TR6 (stock #5056-CHA) listed on Autotrader for $28,995. I'd like to get more information about this vehicle and confirm its availability. Rarely do you get to find survivor-grade classics that look this good. But this 1976 Triumph TR6 is an exceptionally original example of the quintessential sports car (with the paperwork to prove it.) its stunning look today tells you it has lived a careful life. So if youre a true connoisseur of road-carving machines, read on for all the details. This one has such a vibrant green that people will ask what the modern colors name is. 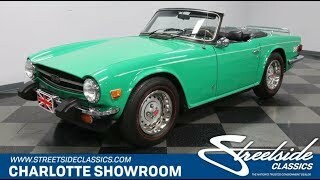 But the cool part is you get to tell them that its the correct Java Green this TR6 was born with. In fact, this shows all signs of being original... and that will seriously impress most enthusiasts. After all, these Triumphs are known for being terrific drivers machines, and so they spent the early years on the open road. Most show signs of heavy enjoyment even before the 1980s. So to find the rare example that still looks this originally vivid all these decades later is a true conversation piece. More than just the paint, people will love the details, like the Union Jack on the rear fenders, bright luggage rack on the trunk, and classic redline tires on factory wheels. Plus, the full-length pinstripe not only highlights the straightness of the body, but it also draws extra attention to the sporty kick-up in the door line. The black interior looks great against the minty green exterior, which is exactly what you want on a convertible thats meant to be open to the world. Just like the exterior, this is highly original and exceptionally well presented. In fact, since this comes with a complete car cover, boot cover, and interior tonneau, you can start to understand the superior level of protection from the elements this car received over the decades. Plush carpeting and bucket seats make for a nice place to spend some time. Plus, theres plenty of premium wood on the steering wheel, gearstick, and dash. And speaking of the dash, youll love the original elements like the full Smiths gauge package and AM/FM radio. But more than just the right survivor-style, the TR6 is a great classic because its one of the few British sports cars that offer roll-up windows and an easy folding top. So if your sunny day road trip ever turns gray and rainy, you can stay protected for the way home. Under the hood is the original 2.5-liter motor, and this even comes with original owner information card to prove this is the original block to the car. The engine bays presentation is a lesson in proper preservation right down to the factory decals. The way this one fires up with gusto is another reminder of the care this car has received over the years. And with the dual Stromberg carburetors feeding the motor, theres plenty of power to move this lightweight convertible in a hurry. This powerful acceleration is in your full control thanks to the four-speed manual transmission. Equip with fully independent sport suspension and front disc brakes, this TR6 really embodies the nimble British roadster. The sale not only comes with the owner information card, but also the original bill of sale and owners manual. It all proves that this is likely the most exceptional TR6 you can get your hands on right now. So dont miss your chance, call today!